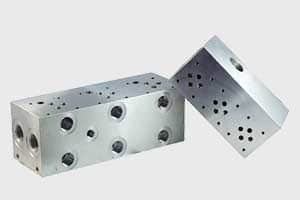 Hydraulic manifold is a hydraulic manifold block made of carbon steel or alloy aluminum. There are many chambers are intergraded inside the hydraulic manifold to meet various requirements in hydraulic systems or install hydraulic valve for modular valves, cartridge valves threaded installation (Sometime use stainless steel for special condition, like water or acid medium ). Hydraulic valve manifold is available to control the fluid direction, hydraulic pressure or adjusting flow rate with its designed chambers and valves. Hydraulic manifold block is easily to maintain, lower cost and standard replacement. 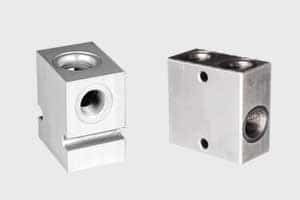 We provide a wild range of manifold blocks for standard of CETOP, NFPF, DIN2430 & ISO4401 or Customized Design available. 100% high quality materials, heavy-duty carbon steel (Pressure Up to Max. 60Mpa(600bar, 8700psi) ) or alloy aluminum (Pressure Up to Max. 21Mpa(2100bar, 3045psi) ) . Cheap prices for bulk orders，all the manifold blocks are manufactured by several high precisely digital center machines. Hydraulic manifold is mounted with cartridge valves as per requirements of hydraulic system, it is available to achieve various hydraulic functions, switching the fluid flow direction, open or close pressure in one or multiple ways, pressure adjustment or maintenance, flow rate control and adjusting by assembled with every function valves, cartridge valve or modular valve optional. Any custom and standard manifold blocks with full range of valves for hydraulic systems and equipment is acceptable. Hydraulic manifolds for directional control valves, pressure control valves, with cartridge or modular mounting, the raw material is high carbon steel for high pressure up to 60Mpa, 600bar hydraulic pressure. All the threads and cavity is standard mounting and customized is available and should be confirmed before production. We produced hydraulic manifolds with longer length for 1 to 10 stations, Cetop3 valves installation, central digital machine manufactured, highly precision dimensions. 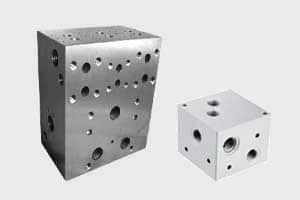 Various size of manifold block are manufactured by us, for different size of hydraulic valves, standard or non-standard dimensions installation. Many years of hydraulic manifold production supplier meets all requirements in hydraulic systems. 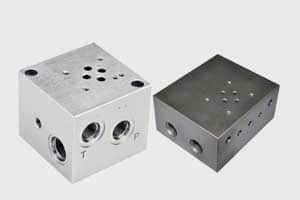 Aluminium materials of hydraulic manifolds produced for hydraulic power packs, the cavity is for cartridge valve installation with precisely dimensions. All surface are colorful treated and smooth processing for good looking and surface installation.